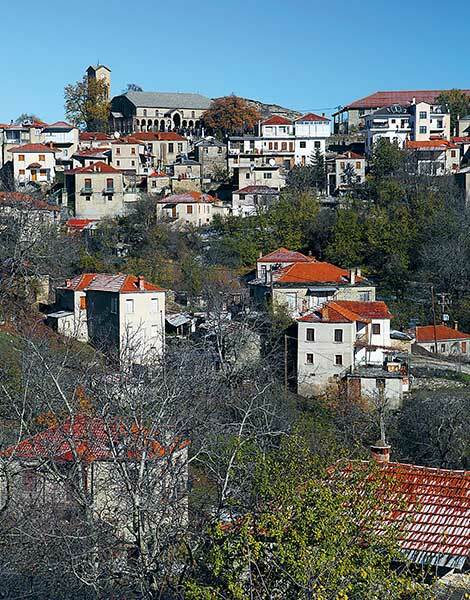 The small town of Siatista in northwestern Greece is the perfect start to an exploration of the Mastorohoria – the villages once home to master builders. Voio is the name of the mountain that rises to the west of Kozani, straddling the border with the regional unit of Grevena. Life up here can be calculated according to the chimneys; most villages are deserted in winter, smoke rising from a chimney is a sign of a rare house with occupants. Our route starts in the small town of Siatista and ends up in the Mastorohoria (“craftsmen’s villages”) on Mt Voio. It is some 65 kilometers in length, a distance that needs about an hour and half to cover – not including any stops along the way. It is a typical, asphalt country road, which, in the winter, demands that drivers be cautious: ice forms on sunless curves; at times streams overflow; and on the verges deep mud formed from the red soil lurks. The landscape is one that evokes a sense of mystery, partly due to the fog, and this makes you feel like a true explorer. There are springs, waterfalls, plunge pools, rocks, and dense forests of oak, chestnut, beech, pine, fir and plane trees. The Pramoritsa River cuts through the area, with dozens of gorgeous bridges spanning it. Siatista – our starting point – is a charming town with a Balkan aura to it. It enjoyed its economic heyday in the 18th and 19th centuries, thanks to the fur trade and the production and sale of liasto wine (naturally sweet, made from sun-dried grapes). This prosperity left its mark in the form of the mansions that came to be built as a result. Today about 50 of these survive, although most of them are crumbling. The list of the ones that can be visited includes Poulkos (tel +30 697.413.7721 or +30 24610.262.10, open daily 08:30-14:30, admission 2.00 euros), and Dolgiras, which operates as a folk museum (Markides Pouliou, tel +30 694.683.4005, open by appointment). Once inside, you’ll be stunned by the beauty of their wood-carved ceilings, their super-sized fireplaces and murals, which tell entire stories. You will also be greatly impressed by the church of Aghia Paraskevi, as the cosmopolitan outlook and new ideas brought back by Siatistan traders are more than evident in its interior. 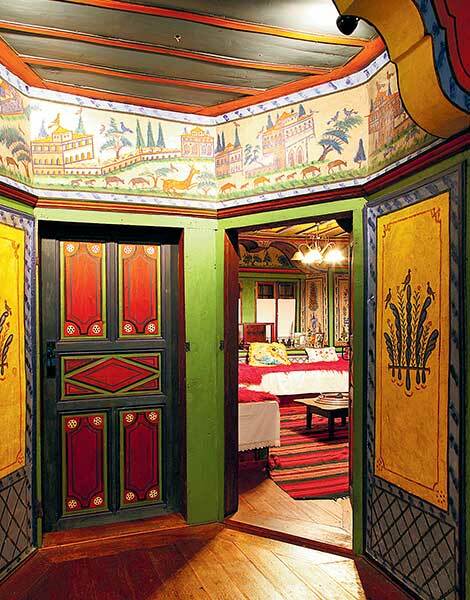 Standout features include the gilded, wood-carved iconostasis and the wonderful murals in the matroneum that depict Aristotle, Plato, Socrates and a sibyl. In town, you can also find businesses that still produce furs and liasto wine. If you choose to overnight in the city, you might consider the accommodations offered by the Siatistino Arhontariki (tel +30 24650.470.20, from 45.00 euros per night for a double, breakfast included), or the Iveris (tel +30 24650.470.54, from 65.00 euros per night for a double, breakfast included). The tavernas Tria Pigadia (tel +30 24650.229.91) and Gravadika (tel +30 24650.227.11) are two good dining options. The higher the elevation, the greater the beauty. Even more so when you approach the Mastorohoria villages, a group of settlements of the renowned Mastrokalfades (master builders who would travel throughout the Ottoman Empire, adorning the entire region with gorgeous stone constructions). Trailblazers among these master builders were the Zoupaniots; they hailed from the village of Pentalofos, and organized themselves into traveling groups known as bouloukia. In the villages they built you can see tower-shaped mansions, constructed using chiseled stone and wood, with carved cornerstones forming their edges, large outer gates that allowed pack animals to pass through with their loads, and sculpted slabs set in walls. You will also see sagely-built single or multiple-arched bridges, wondrous cobbled lanes, fountains and churches that are works of art. 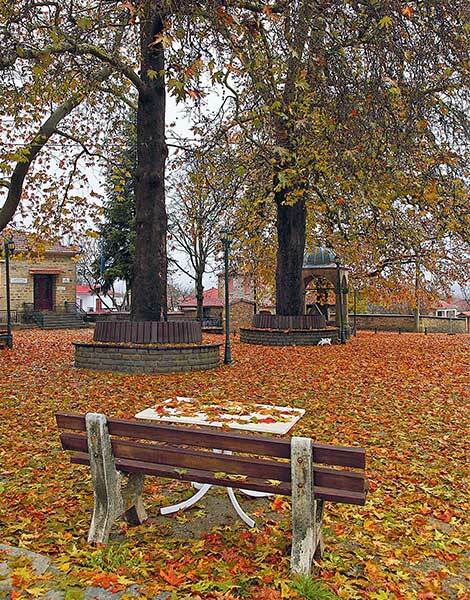 Every village has its own bridge, its square strewn with the leaves of plane trees, its church, and its kafeneio (traditional coffee shop / eatery). 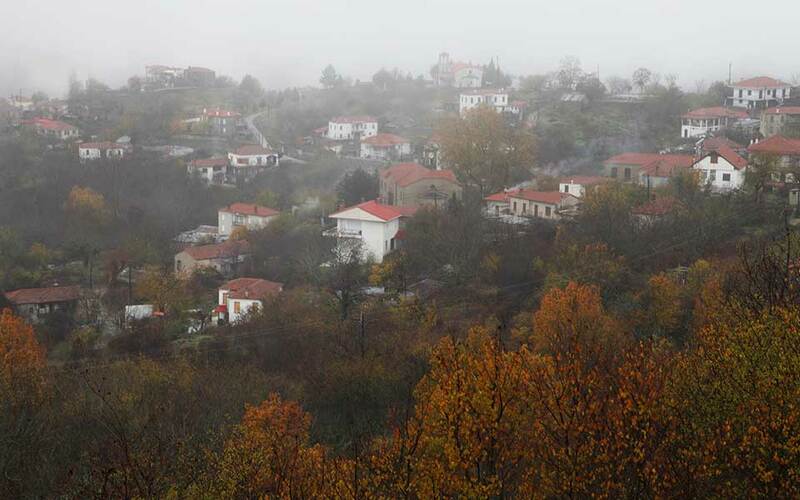 Chrysavgi ranks as one of the loveliest of these villages. 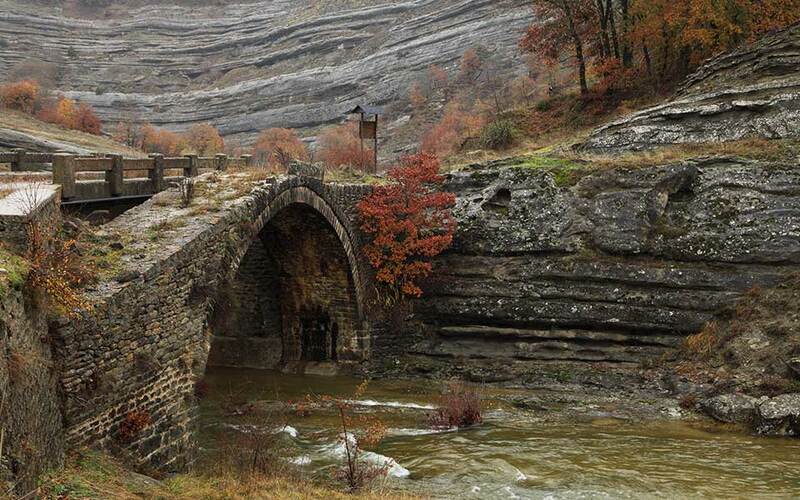 Here, forests give way to rocky slopes, the Paliomageiros River snakes through the valley, and two bridges complete the scene: the Miralis, at the entrance of the village; and, the even more imposing one located next to the water mill and manmade waterfall. Dilofo is beautiful, too with all the buildings in harmony and the Samaras family’s cheese-making business keeping the village alive. 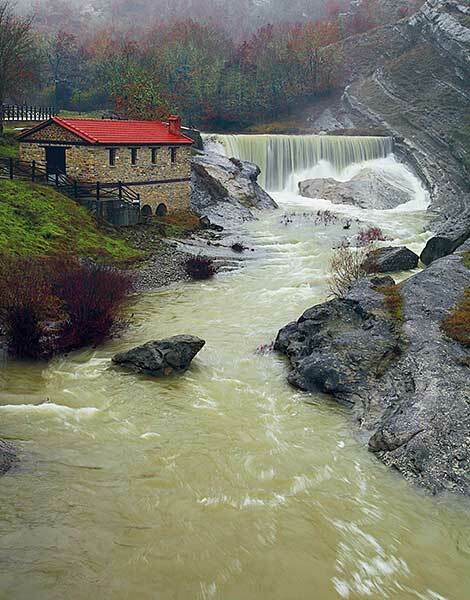 In the end, however, all roads lead to Pentalofos, which was known as Zoupani in years past. Two sculptures – one depicting a Zoupaniot master builder, the other dedicated to the women of Pindus – welcome you to the village, which is perched at an elevation of 1,050 meters. Alongside the sculptures live a few hundred inhabitants who reside – largely forgotten – in the mountains, surrounded by stone dwellings, churches and kafeneia. At the last you can join them and indulge in the local tsipouro (a pomace brandy), wild mushrooms and various pickled delicacies. You might also be treated to a fascinating story or two, and perhaps pick up a few Koudaritika words along the way, thus getting a taste of the secret dialect invented and spoken by the bouloukia. Whatever you do, don’t leave the area without going on a stroll through neighboring Vythos and visiting the Aghias Triada Monastery, which dates to 1740; the latter is a real fortress, located in the middle of nowhere. The route linking Siatista to Vythos is 60km long.